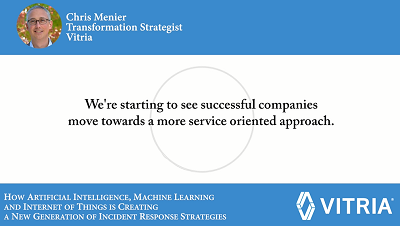 Vitria’s Chris Menier Discusses How Artificial Intelligence, Machine Learning and Internet of Things is Creating a New the Generation of Incident Response Strategies. The availability of real-time analytics is driving new and enhanced services in many industries as organizations leverage the ability to contextualize experiences for customers in real-time. A critically important factor that increasingly will become a competitive differentiator has been the evolution of incident response strategies and how the introduction of new technologies — especially artificial intelligence (AI), machine learning (ML) and the Internet of Things (IoT) — creates new opportunities to work smarter, faster and more cost-effectively. As these technologies converge, organizations are shifting the focus Incident Response Lifecycle Management (IRLM) from simply monitoring and responding to process disruptions and placing greater emphasis on monitoring and improving the customer experience. In a podcast interview for journalists, Chris Menier, Vice President and Transformation Strategist with Vitria, offers insight into the strategic investments and the industry requirements necessary for next-generation incident response strategies and deployment of a digital operations program.